Skinny Chicken Marsala (Healthy Chicken Marsala) – Looking for healthy chicken recipes? 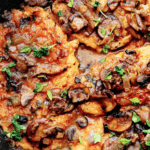 Try this Healthy Chicken Marsala. This delicious skinny chicken marsala is lightened up on fat but not flavor! So last month, I made a commitment to actually dust off the cookbooks I collect and use them. I started with this Strawberry Cheesecake Ice Cream from the Homemade Decadence cookbook to ease myself in slowly. Then I decided I needed a dinner recipe to try next. Out popped my barely skimmed new book The Skinnytaste Cookbook. Filled with such promise, I knew it was an outright travesty that I hadn’t so much as read the introduction and had only resorted to gawking at the gorgeous photos a few times. But then I spotted a gem: Skinny Chicken Marsala! I originally bought the book to improve our family eating habits. Because Gina’s blog Skinnytaste is all about providing lighter versions of flavorful recipes that we all know and love, I knew I was in good hands. And boy was I right. I started with Gina’s version of healthy chicken marsala. I happen to adore a traditional chicken marsala recipe. A hot plate of it makes me warm in my bones. When done right, the chicken is insanely tender, the sauce is rich and layered, and the mushrooms and herbs add just another level of perfection to round out the dish. I find it insatiable and outright impossible to turn down. A. Butter in moderation is absolutely fine in skinny dishes. A small amount goes a long way. I will probably no longer toss entire sticks into my healthy dinner recipes. B. Flavor is the key focus in skinny meals. In this recipe, I didn’t feel like I lacked anything because the tender chicken and the depth of flavor from the wine, spices, shallots and mushrooms really made me feel as though I was having any regular full fat meal. If you focus on flavor, you won’t miss the fat. That is exactly what this healthy chicken marsala recipe does. Looking for healthy chicken recipes? Try this Healthy Chicken Marsala. 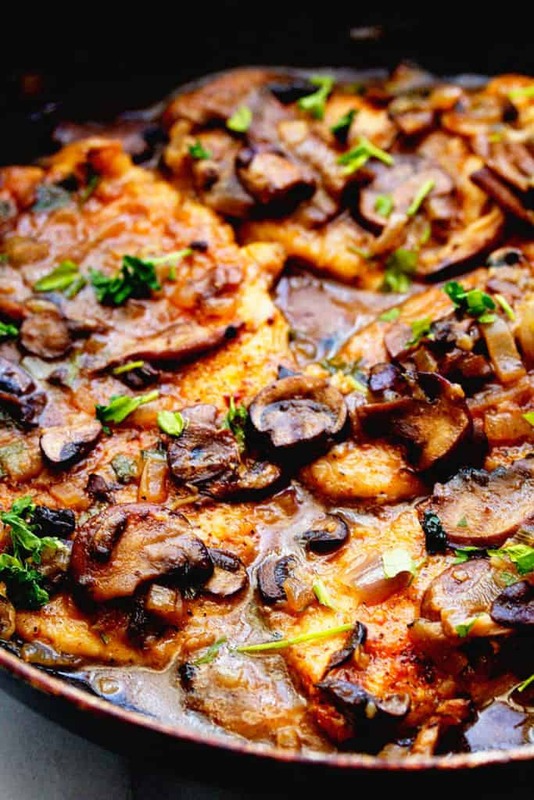 This deliciously satisfying skinny chicken marsala from SkinnyTaste is lightened up on fat but definitely not flavor! Slice the chicken breasts in half horizontally to make 4 cutlets. Put each cutlet between two sheets of plastic wrap and lightly pound them until they are about 1/4 inch thick. Season with 1/2 teaspoon salt and a pinch of black pepper. Heat a large nonstick skillet over medium-high heat. Add 1/2 tablespoon of the butter and 1 teaspoon of the olive oil to the pan and swirl the pan until the butter has melted. Add the chicken and cook until slightly golden on both sides, about 3 minutes per side. Transfer to a baking dish and place in the oven to keep warm. Add the remaining 1/2 tablespoon butter and 1 teaspoon olive oil to the skillet. Add the garlic and shallots and cook until soft and golden, about 2 minutes. Add the mushrooms, season with 1/8 teaspoon salt and a pinch of black pepper, and cook, stirring occasionally, until golden, about 5 minutes. Sprinkle in the reserved 1 teaspoon of flour and cook, stirring, for about 30 seconds. Add the Marsala wine, chicken broth, and parsley. This looks amazing!!! Going to try it tonight– question! Is it 241 calories in one whole breast or in one of the 4 pieces of chicken, after you cut it? Just made this tonight and it was a big hit! Yummy! Hooray! I’m so glad you enjoyed it! This was delicious! Thanks so much! This is one of the only meals I make that my husband enjoys eating and says he doesn’t feel like he is eating healthy! My 5 and 8 year olds even eat it. It’s delicious. Thank you! It is really delish. I absolutely love this recipe. So glad you enjoy it too! dry or sweet marsala in this recipe? If you are a weight watcher, you always prepare the same food, but the truth is you have to try different varieties of recipes and also good for weight loss. Your recipe one example of a different but healthy recipe that is also good for weight watchers. Thanks for sharing. Made this tonite and it was soooo good. Thank you for posting this reciepe. Oh, my freakin GOD. I Love Marsala and yours is Incredible!!!! I made it this evening for my baby, She is a WW client so on my days off I look for recipes to make her dinner. I was looking today for a Chicken recipe and came across yours. It Truly Is Delicious. I’d give it 10 Stars if I could. I am going to make this for my entire family. I’m sure they will Love It. Thank You!!! YES it is amazing. I really love the flavor in this recipe as well. I don’t like mushrooms. Can I make this dish and achieve the same flavor so without them? Hi Michelle, it won’t be exactly the same but the chicken is quite flavorful on its own. I haven’t had chicken marsala in so long. Love this healthier version! This looks so rich and comforting. I am putting this on my list to try! Pinned! I totally need to dust off my cookbook collection, I have so many amazing books in there! This skinny chicken marsals is begging to be made in my house, I’m all for butter in moderation 🙂 YUM! Girl, I need to keep that promise of dusting off the books. This looks delicious!! I’ve never tried chicken marsala (can you believe it) but you’ve convinced me to give it a go! Looks so gorgeous! I think we should put together a club. I have at least, at the very least, 60 cookbooks that I very rarely use. I just keep collecting them because I can’t help myself. I just love them! I really should use them more. Love this recipe. Pinned. My cookbooks are often neglected, too, so I have to remind myself to use them! 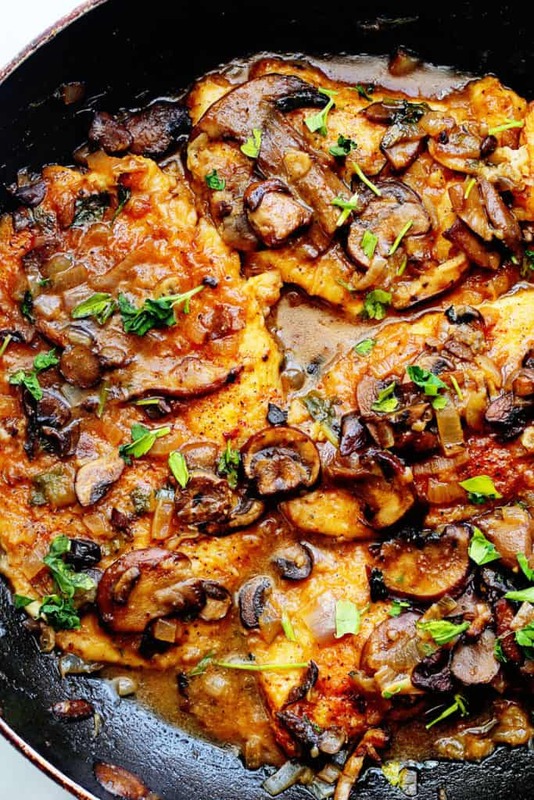 This skinny chicken marsala doesn’t look skinny at all! Your photos are making me hungry! What a dream!! This looks so heavenly! Hooray thanks so much Beverley! I will definitely keep posting some healthier recipes for you to try!!! And thanks for following along. 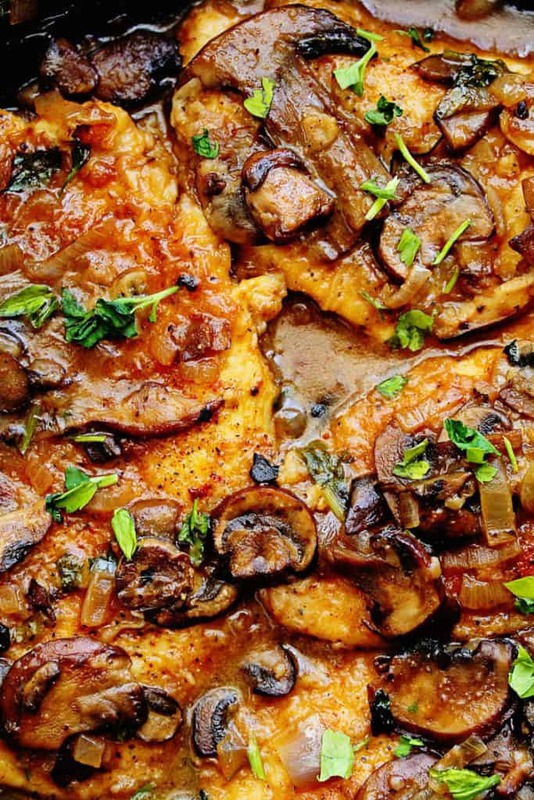 That seriously looks like the best chicken marsala ever! Love that it is lightened up but looks like it has tons of flavor. That picture looks screen licking delicious!! I absolutely adore the fact that you lightened up chicken marsala! It’s one of my favorites! Yeah! I love chicken marsala. Can’t wait to try it. It is seriously good food for the soul. I wouldn’t care if this dish is skinny or not, it looks too good to pass up no matter what! Fabulous job Jocelyn! Well girl you have certainly warmed my heart. Thanks so much hon! This looks absolutely incredible! I love, love, love anything with all those gorgeous flavours added in! Oh I LOVE Skinny Taste! I met Gina briefly at Food Blog Forum and I totally had a fan moment. This look delicous girl! Gosh I would have loved to meet Gina! OMG! Oh yummmm! I love chicken marsala and never miss it when I to got Cheesecake Factory. Guess what I’ll be making for dinner tomorrow night. Gosh I never ordered it at Cheesecake Factory. I bet its good! This looks so amazing, I love that you lightened up a great classic! Thanks Amanda! The recipe is so delish! This sounds and looks incredible! I love chicken marsala and am always looking to eating healthier. Pinned! Thanks for the pin Rachel! I’ve never tried chicken Marsala, although I have a recipe for it. This dish looks so good and my family and I would seriously mangle this dish. I don’t do “skinny” dishes, but would be willing to try this recipe for sure. The fact that this dish uses mushrooms is one of the reasons I would put a hurtin’ on it. Question for you, as someone who cannot eat most meats (I have an illness that limits me from anything but seafood as it is easy to break down), could this be made subbing in my favorite white fish filet with good results? I’m thinking seabass would adapt to the flavors well. Obviously cooking time will need to adjust. I intend to make this for my husband with chicken as written, recipe looks amazing! Hi Lauren, I definitely think this can be tried with a white fish fillet. I would definitely lower the cooking time so the fish doesn’t overcook. Oh yeah a cocktail book sounds fantastic! We loooove chicken marsala! It is one of our favorites, I can’t wait to try this skinny version! Chicken marsala is is a favorite of ours. I love that you made a skinny version. I will definitely have to try it. Swoon! I’m always on the look out for healthier recipes! Yummy! I never had Chicken Marsala before. A FB friend posted her version yesterday and now I see yours. I’ll take that as a sign for me to make some. I think that’s a good sign. It means you must make it! I have a million cookbooks that I never use. This post has reminded me that I need to drag some out and start using them. I love this recipe, Jocelyn! There’s nothing better than a good Chicken Marsala and I love that it’s a “skinny” version. Great post! Thanks so much Bill! I think we all can relate to the whole unused cookbook situation. Chicken marsala is the best. But yep, hard to make it with all that butter and be okay with it, so this is awesome. It looks perfect! Hooray thanks so much Mir! It really does put the flavor on the chicken. I loooovvvvveeeee chicken marsala!!! I have a go-to recipe but will definitely give this one a try! and I still need to get this cookbook!!! Yes you should definitely check it out! HI! Tried this recipe tonight & it was easy, light, & delicious 🙂 The only question I have is how did you achieve that rich, deep color? Mine came out lighter looking and I’d like to fix that next time. Thank you! I actually let the colors really intensify and allowed it to simmer for a bit longer to achieve that color. Maybe try thickening the sauce a little more next time. So glad you enjoyed it.